Review: Mary Rose, Riverside Studios *** | Fourthwall Magazine & The Drama Student – The magazine for careers in the performing arts – actors, drama students, directors, producers, writers, production crew. JBR reviews an atmospheric reading of J.M. Barrie’s dark Mary Rose at Riverside Studios. J.M. Barrie’s Mary Rose presents as a dark obverse to his better known Peter Pan. As a counterpoint it reveals a somewhat uncomfortable preoccupation with childhood innocence extending some of the themes of Pan; the child who cannot grow up, and meditation on death and loss. In Mary Rose these are distorted somewhat, revealing an altogether less delightful narrative than the Disneyfication of Pan that we are used to. Structurally it approximates a late Edwardian ghost story, and reflecting much of the writing of the period, marries the highbrow style of the Belle Epoque with a more popular drawing-room comedy. 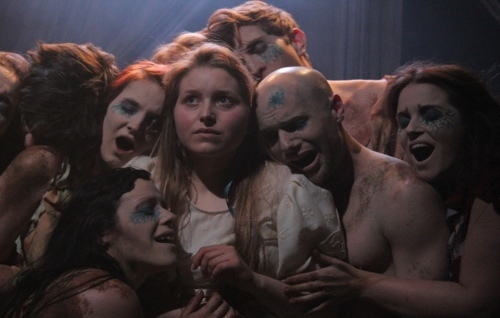 Matthew Parker’s skillfully directed production at the Riverside Studios wisely focuses on the ghost story, and this production excels when Parker populates the stage with trapped spirits. Although at times over-choreographed, the ensemble nonetheless demonstrate a haunting metaphor – that those who are lost are never far gone from our world. In astonishingly committed performances, the ensemble lend Cherry Truluck’s detailed set an eerie life of its own. Maria Haik Escudero’s haunting musical score accentuates the unease throughout the play while Gary Bowman’s lighting design, streaming in through the thousand chinks and cracks that adorn Truluck’s set, further adds to the atmosphere. The drawing room scenes, with their laboured comedy seem at odds with Parker’s otherwise intricate work, and while Maggie Robson, as Mary’s mother beautifully balances heartbreak and melancholy, with a forced stoic humour, the scenes feel strained and underpowered. Underpowered too is Jessie Cave in the titular role although much of this is down to the ethereal child-woman she must convey. Stronger work comes from Carsten Hayes as Mary’s husband, who has a more fulfilling journey to embark on, from gauche suitor to lonely widower. DogOrange have produced an effective reading of an intriguing, largely forgotten Barrie work which is largely visually stunning and affecting enough to warrant a visit.